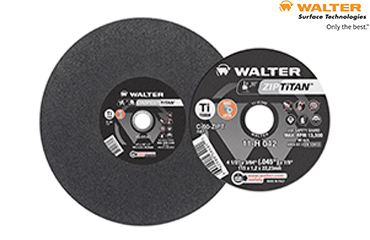 Walter Surface Technologies, the global industry leader in surface treatment technologies, announced the release of its new Zip Titan™ and Chopcut Titan™ cutting discs, adding to their extensive line of world-class cutting abrasives. The Zip Titan™ is part of Walter’s industry leading Zip™ Wheel family of products, which through testing and real-world documented cost savings, constantly shows longer life and the most cuts per wheel in the industry. The Chopcut Titan™ belongs to the Chopcut™ family of products, and is designed specifically for performance cutting on portable chop saws. For more information visit www.walter.com.